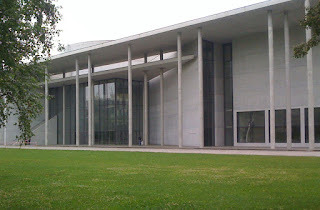 With the opening of the Brandhorst just around the corner, the Pinakothek der Moderne looks more alienating than ever. Worse, the galleries aren't laid out well, and the light is relentlessly cold no matter what the weather. On a grey day like the one on which this photo was taken, this Pinakothek is downright gloomy. Designed by Stephan Braunfels, the museum opened in 2002 — startlingly recent, considering how remote and aloof it seems. I'd have thought those qualities a thing of the past by then, especially in a civic building.